God ascended with jubilee, and the Lord with the sound of the trumpet, alleluia. Confiding O Jesus! in this promise; resolved to follow Thee in all the mysteries achieved by Thee for our sakein the humility of Thy birth at Bethlehem, in Thy sufferings on Calvary, in the joy of Thy Resurrectionwe hope, also, to imitate Thee, when our mortal course is run, in Thy glorious Ascension. Meanwhile, we unite with the holy apostles who rejoiced at Thy triumph, and with the ransomed captives of limbo who entered heaven in Thy company. Watch over us, O divine Shepherd, while we are in our exile! Tend Thy faithful sheep; let none be lost; lead them all to Thy fold. 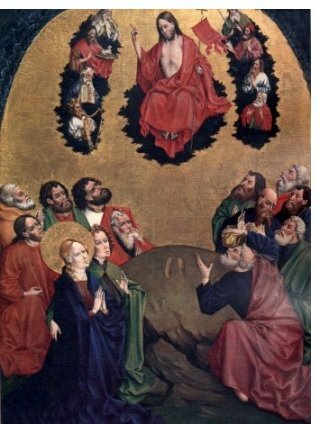 The mystery of Thine Ascension shows us the object of our existence; it reanimates us to study more attentively, and love more warmly, all Thy other mysteries. Our one ambition, then, our one desire, shall henceforth be our own ascension to heaven and to Thee. It was for this Thou camest into the world: by humbling Thyself to our lowliness, to exalt us to Thine own majesty; and by making Thyself Man, to make man a partaker of Thy Divinity. But until the happy day of our union with Thee, what would become of us without that Power of the Most High whom Thou hast promised to send us, that He may bring us patience during our pilgrimage, fidelity to our absent King, and that solace of a heart exiled from its God, love? Come then, O holy Spirit! Support our weakness; fix the eye of our souls on the heaven where our King awaits us; and never permit us to set our hearts on a world which, had it every other charm, has not the infinite one of Jesus' visible presence! The following prayer was taken from the Mozarabic breviary. Only-begotten Son of God! who, having conquered death, didst pass form earth to heaven: who, as Son of Man, art seated in great glory on thy throne, receiving praise from the whole angelic host! grant that we, who in the jubilant devotion of our faith, celebrate thine Ascension to the Father, may not be fettered by the chains of sin to the love of this world; and that the aid of our hearts may unceasingly be directed to the heaven, whither thou didst ascend in glory, after thy Passion. Amen.